Massive disruption is coming, and the only question is whether your firm is going to cause it or fall victim to it. 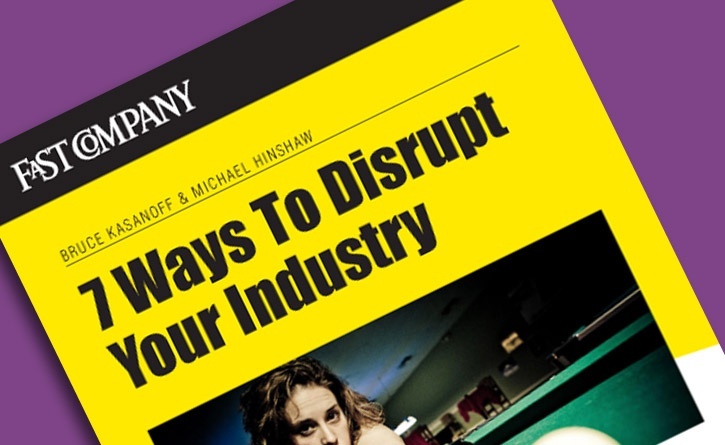 Disruption is not easy—either to create or to confront. We have no illusions about that. 1) Totally eliminate your industry’s persistent customer pain points. Each industry has practices that drive customers crazy. Technology providers drive customers crazy with technical support that often requires long waits on hold and hopelessly complex interactions ("Just find the serial number on the back of your device and type that into the space provided along with your IP address and the exact wording of the error message you encountered"). Unsurprisingly, this is the exact type of practice that causes customers to believe a company is behaving stupidly. What practices exist in your industry that drive customers crazy? How do all companies in your industry behave stupidly? Identify these types of practices, and wipe them out. Think: can we turn our process or perspective around, to look through the customer’s eyes as though they were the company and we were the customers? As we write this in November 2011, a company we have been tracking for some time—Simple, formerly known as BankSimple—is trying to take a machete to the insanely complex and confusing world of consumer banking. Recognizing that banks do a pretty good job of managing money but a poor job of managing customers, Simple has been designing vastly simpler customer interfaces and tools. Simple plans to partner with, not compete against, established banks. They’ll manage the customers while their banking partners manage the money. The more complex the processes and practices in your industry, the greater your opportunity to gain competitive advantage by simplifying them. Yes, doing so will be very hard. But that’s the whole point; the first firm to do so gains tremendous advantages. 3) Cut prices 90 percent (or more). Incremental change doesn’t disrupt an industry; radical change does. Radical price reductions require radical new processes and business models. Smartphones and tablets create numerous opportunities to identify these. Recently we replaced a $500 marine navigation unit with a $20 iPad app that works better. You don’t cut prices by 90 percent through marginal improvements in existing products. You do it by asking, "What problem are we trying to solve for the customer, and how do these disruptive forces create opportunities for us to solve it in a far more efficient manner?" 4) Make stupid objects smart. We didn’t think this one up. The race is on to make everything smart, and the dumber your products were to begin with, the greater the opportunity to make them smart. Think of a garbage dumpster that calls central dispatch when it is full, eliminating the need for the customer to do so or your office to send a driver out unnecessarily. That same dumpster could warn the customer when it is overweight, and point out that it would be cheaper to empty it now than to further overfill it. No offense to dogs, but their collars could alert owners when the dog wanders away, barks excessively, or jumps on the furniture. Light bulbs could flash before they burn out. Baseballs could announce how fast they were thrown. Plants could politely request water when they are too dry, or shout out when you try to overwater them. Take every product you sell, and make it smart…or accept the fact that you must forever more compete on price and accept low margins. 5) Teach your company to talk. Apple's Siri personal assistant on the iPhone allows you to have a conversation with your phone. Your iPhone can now access the Internet as well as the information it stores, both understanding and responding appropriately to your statements. Flash-forward two to five years from now. What if your company could talk to customers? We don’t mean that your employees talk on behalf on the company. We mean that a digital, computerized persona speaks on behalf of your firm. It takes orders. It provides support. It answers questions. It upsells. It issues refunds. All of this, and more, in response to verbal requests by customers. The toughest part of this challenge is not technical, although a few problems still need to be solved. The tough part is knocking down the walls that separate your databases and departments. It’s deciding whose product gets cross-sold, who gets "credit" for sales, and who "owns" the customer. Our view is simple. No one owns the customer, and you either do what’s best for the customer or you will lose him. But the real question we want to put forward is this: what happens if your competitors’ companies talk, but yours doesn’t? 7) Make loyalty dramatically easier than disloyalty. According to Don Clark writing in his Wall Street Journal blog, Intel executive Mooly Eden once asked an audience how many had cellphones, and then how many were married. You can store customer preferences, and act on them. You can save the customer time, money, or effort—especially by eliminating repetitive tasks. You can provide auto-replenishment of needed supplies. You can monitor products remotely, and service them before they break instead of afterwards. Think about every major purchase decision your customers face in your industry. How can you make it easier for customers to remain with your firm? Now, think even bigger. Can it be five or ten times easier? Subtlety can be lost on today’s customers. The challenge is to make loyalty so much more convenient, so radically easy, that customers won’t even consider switching to a competitor. Ever. Adapted from Smart Customers, Stupid Companies: Why Only Intelligent Companies Thrive, And How To Be One Of Them, co-authored by Michael Hinshaw and Bruce Kasanoff, (Business Strategy Press, 2012). Follow Michael and Bruce on Twitter.